This year, we've been experiencing our first winter in two years. While we've had a blast playing in the snowy mountains, one thing we've really missed is camping. A few weeks ago, the weather was looking good all weekend along the coast so we jumped on the opportunity to get out and enjoy it. 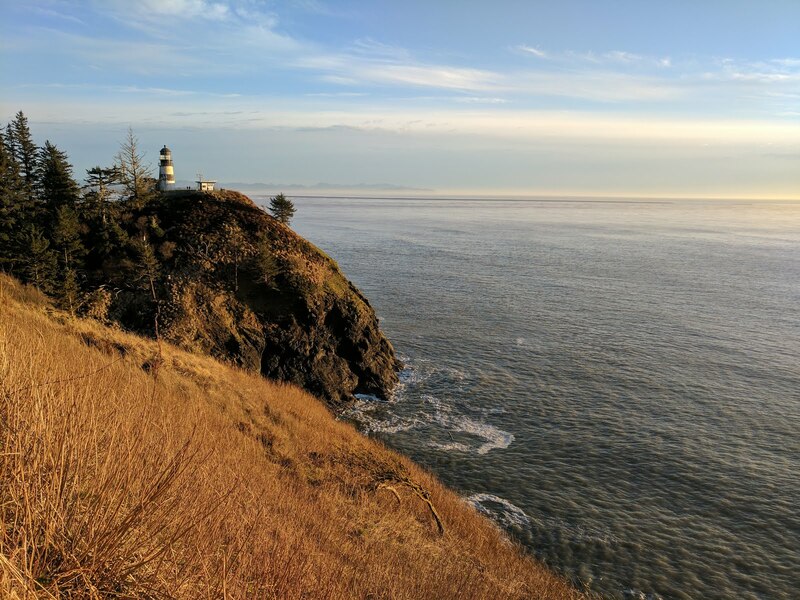 Friday night, after work, we packed up the whole family and headed for Astoria, Oregon. 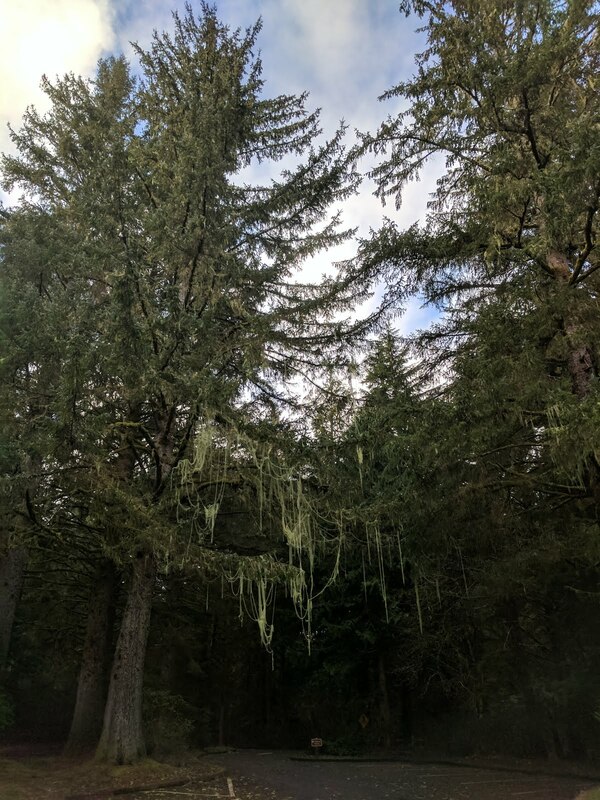 We didn't arrive to our campsite until after midnight so it wasn't until the next morning that we got to see our beautiful surroundings. 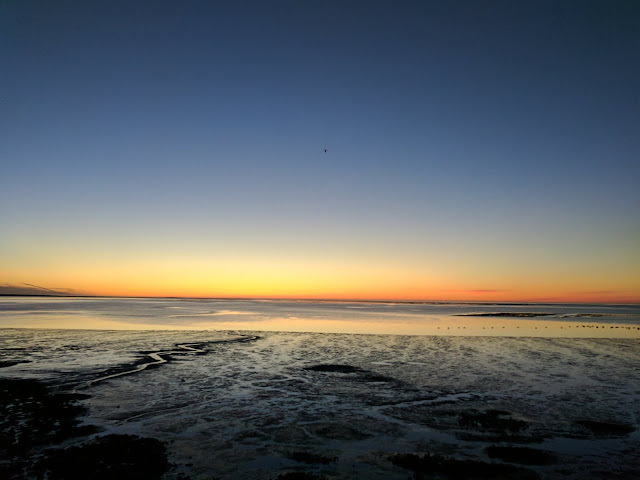 We camped at Fort Stevens State Park, not far from the beach and after packing up in the morning, we made our way to the ocean to play in the sand and see their famous shipwreck. Had we been there at low tide we could have gotten a close up of the shipwreck which makes for a pretty cool picture against a beautiful ocean sunset. Maybe next time. 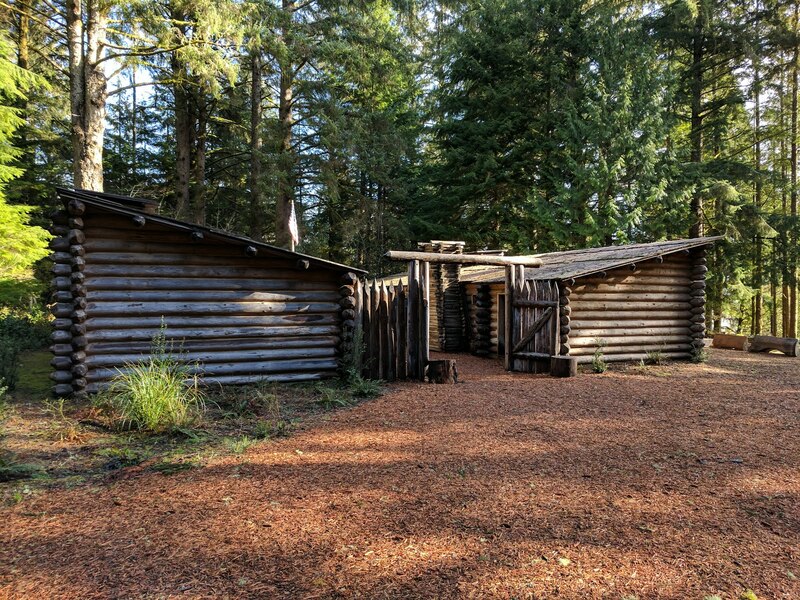 Afterwards, we headed over to Fort Clatsop where Lewis and Clark spent a "miserable" winter preparing for their journey back across the United States. Ever since we moved to the West Coast, we've discussed how amazing it was that early explorers traversed this part of the country. 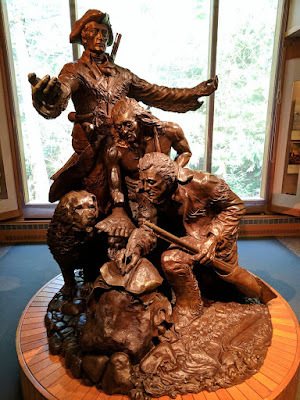 A few months ago I read the book Undaunted Courage about the Lewis and Clark expedition. 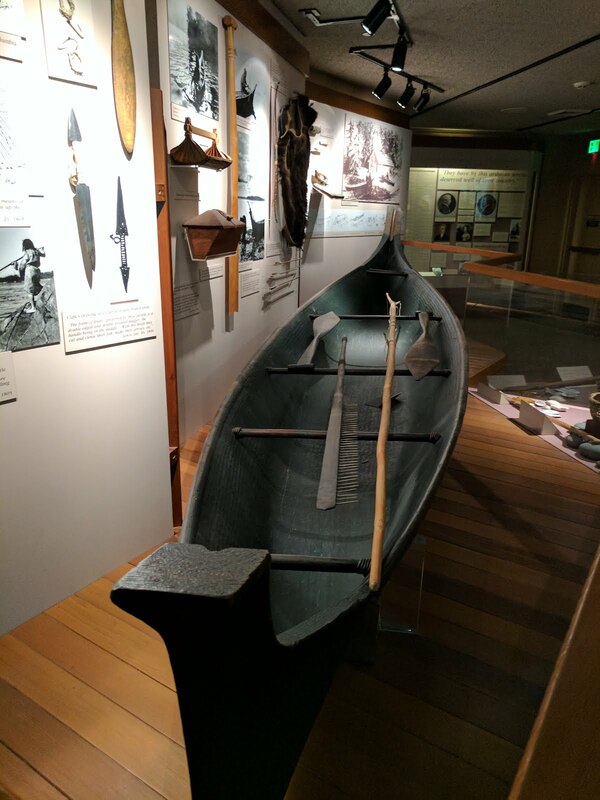 I wish I had the book with me when we visited Clatsop. Reading their story before hand made me very interested in the site, but having had it with us would have really brought the place to life. The visitors center helped to fill in a lot of history and we tried explaining the journey these men took across the US to Landon, hoping he would grasp the significance of what this small group accomplished. 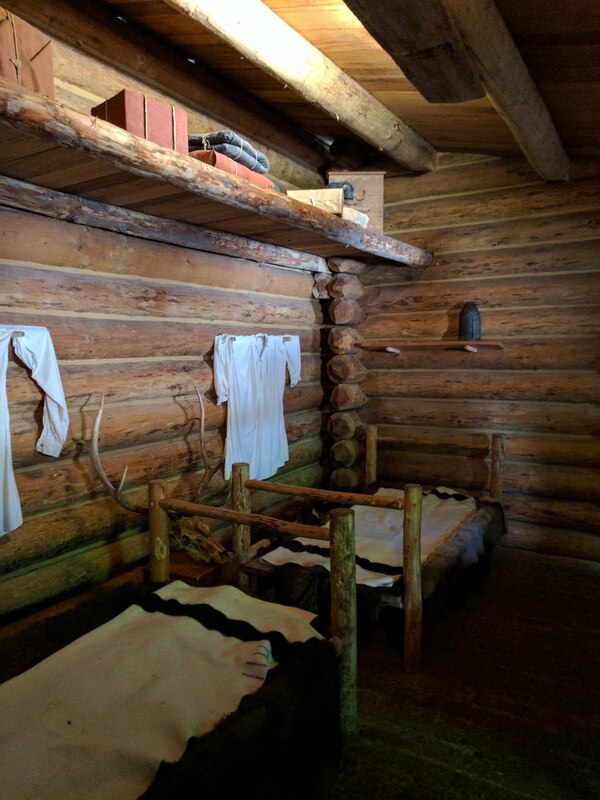 The original fort that the party built no longer exists, but a replica has been built on the site. It gives you a great idea of what life was like for these 34 people in 1806. They even had rooms set up as they would have been at the time. 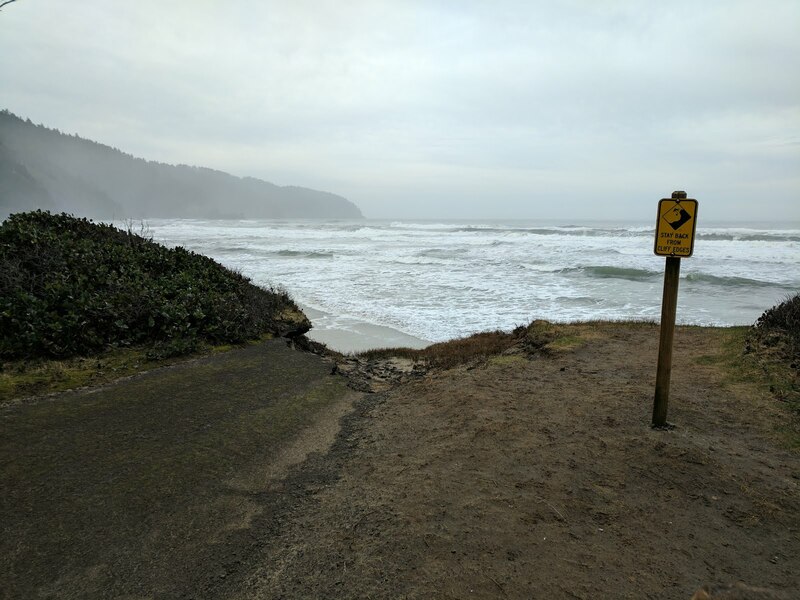 After our visit at the Fort, we headed towards Canon Beach. Famous for their massive haystack rock. We took a long walk down the beach enjoying the sunshine, water, and sand. We had ALL missed the ocean terribly. Not sure which of the kids enjoyed it more. Both had plenty of fun playing with sticks, running around, and playing on the beach. We walked down the beach to the small town, had a great lunch, and then walked back to the car and onto more adventures on another beach. We headed to Cape Kiwanda which we visited way back HERE in July of 2015. Despite all the changes in Landon, Adam hasn't changed much and jumped on the chance to drive his new car on the beach again. Oregon does the coast right. All beaches are open to everyone including dogs. 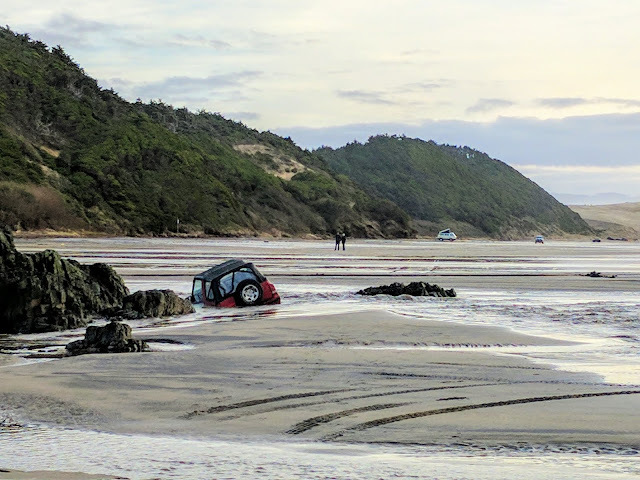 And while you normally cannot camp on the beach, a few allow you to drive your car. We left Kaiser out to run around while we drove. We even gave Landon a go. Did I mention how much we all have missed the ocean? Living 5 minutes from it in San Francisco really spoiled us. It was so refreshing to be back on it hearing the waves crash. As we drove along the beach we came across a submerged car and learned what not to do. 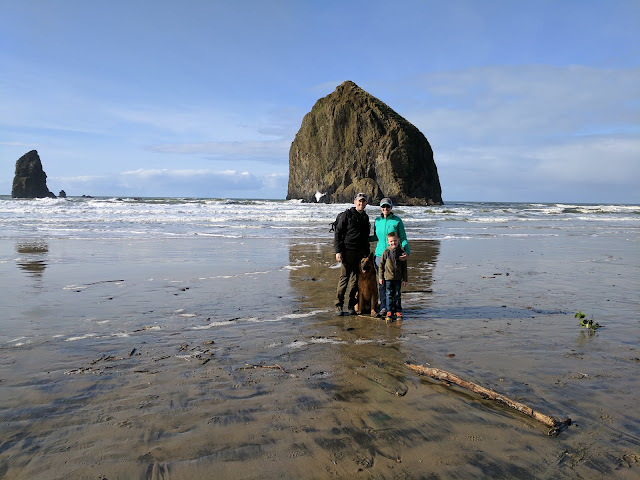 We watched as a tow truck came down and winched it out of its hole before heading over to another drivable beach with another famous haystack rock. The second night we stayed about 100 ft from the beach at Cape Lookout. After grabbing some pizza we headed to our campsite, popped up our tent and played some games. In our new comfy tent, staying inside and having epic BeyBlade battles was actually pretty fun. We didn't have a campfire, but I don't think any of us minded too much. The next morning we woke up and cooked a hearty breakfast. We are getting better and better at cooking with every trip and finally got a chance to use our new stove we bought a few a months ago. It was wonderful! Kaiser hung out in his crate while we ate breakfast. This was our first trip taking him camping while we slept in the rooftop tent. We have an annex room that attaches to the bottom of the tent that we planned on putting him in, but this trip he ended up just sleeping in his crate in the back of the car. He seemed to do just fine, we just wish he didn't take up the entire back of the car. After breakfast, we walked over to the beach and stretched our legs. This beach was much different from the other beaches nearby. The tide was coming up so we made a game of running along the sand until the water came rushing towards us at which time we jumped up on the rocks and fled toward dry ground. It wasn't the beautiful sunshine day we had the day before, but we had a blast running along and playing on the beautiful coast. We walked South on the beach for quite a bit then headed up to a pathway and made our way back to our campsite. We were hoping the sun would come out while we were gone and dry off the moisture on our tent roof. Back at the campsite, the roof was still damp so we spent time wiping it down and messing with some things on it. 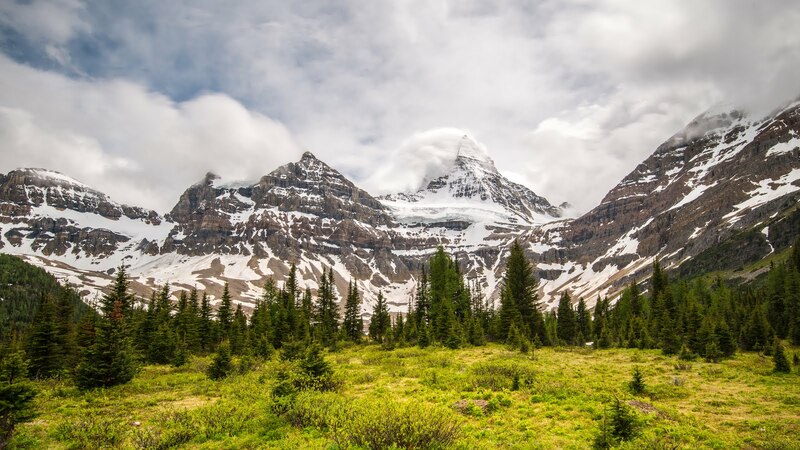 Rooftop tents are a fairly new thing in the world of camping, but I think they will become more and more popular with time. These were our first two nights in ours and we really loved it. It's a step up from normal tent camping and makes the entire experience that much more enjoyable while not taking anything away. I have a feeling we will be camping every weekend this Summer. Plus it is really easy to drive your car to an epic place, unzip the cover, pull down the ladder and climb in. Voila! Once we packed up the tent, we started heading North again toward home. We stopped by the Tillamook cheese factory which we missed our first time in the area. We are big Tillamook cheese fans in the Lewis house so it was fun to be able to see exactly where our cheese is made. The factory has a self-guided tour which was interesting, but short. Since it was a Sunday the operation wasn't in full production, but there were a few lines cutting and packaging large blocks of their delicious cheese. The best part was the cheese tasting and lunch we had at their cafe. We followed it all up with some of their famous ice cream which we had never tasted. The caramel butter pecan was amazing! I just need to make sure and never let it sneak into my grocery cart. After sufficiently stuffing ourselves we headed to one last beach. By now the sun was really starting to shine so we popped open the tent one last time to get it all nice and dry. The only downside to this tent is not having a good place where we live to have it open. The boys played on the beach for an hour while I hopped into the tent and rested a bit. Once again, Oregon has the coolest beaches. Back in the car, it was Landon's turn to take a rest. He's hit or miss on car naps these days, but two days of running around along the coast finally caught up to him. He passed our mid-drawing. We made our way back into Washington and scrambled to make it over to Cape Disappointment before the ranger station closed at 5pm. Landon wanted to turn in his Lewis and Clark junior ranger booklet for a new badge. We made it just before they shut their doors and after getting his badge, took a short look at the beautiful scenery. With so little time, we decided we just have to come back and make a weekend of this area. As we drove home the sun started to set and we were driving from scene to scene of a gorgeous sunset. We found ourselves constantly pulling over until the last bit of sunlight faded. This weekend was exactly what we needed. Fresh air, sunshine and ocean waves. We were SO lucky that the coast cooperated with us over the two days and gave us exactly want we needed. Unlike Lewis and Clark, our weekend trip to Astoria was anything but miserable. 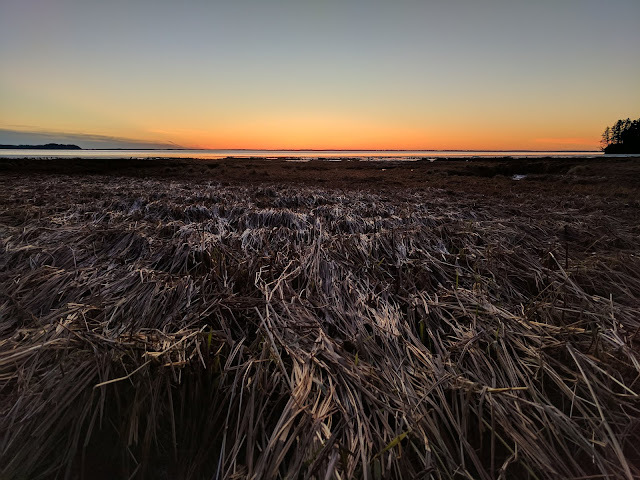 It might be a few more months until we have another great weekend on the coast, but whenever we can we will be right back there doing it all over again. Now that we live in an area with a winter wonderland, there are so many winter activities right in our backyard. One such activity that has been on my bucket list since the beginning is a sleigh ride. About two hours from our house is one of our favorite little towns of Leavenworth, WA. We've enjoyed hiking in the nearby mountains in the summer (HERE) and visiting the cute little Bavarian city for a fun day. With my Mother-in-law visiting for her birthday in December, we knew just the perfect birthday gift, a sleigh ride and trip to Leavenworth for the day. 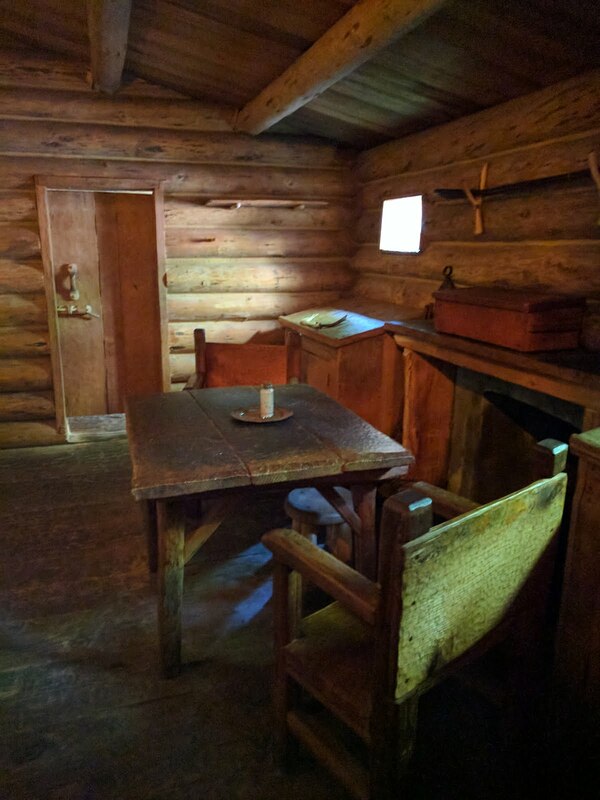 We arrived for our afternoon sleigh ride at the Mountain Springs Lodge early enough to have some lunch at their cozy lodge. The setting is so beautiful and peaceful that I would love to come back and stay over a long weekend. Not to mention, check out the snowmobile tours. After lunch, Landon got to play in the snow for a few minutes while we waited for our ride to begin. There's always time for snow angels and catching a little snow while you do so. When making the reservations they asked if there were any special occasions and we made a note it was my Mother-in-law's birthday. They must have written it down because when they loaded us up on the sleighs, they had her sit in the front with Landon. They had warm fleece blankets to cover ourselves while we rode which was great because it snowed for most of our 45 minute ride. Despite the snow and obviously cold temperatures, the sun was out a good portion of the time which is so rare in the mountains in the winter. We started off by heading into a huge open field. There were two sleighs and we were part of the second group with the first sled always a little in front of us. 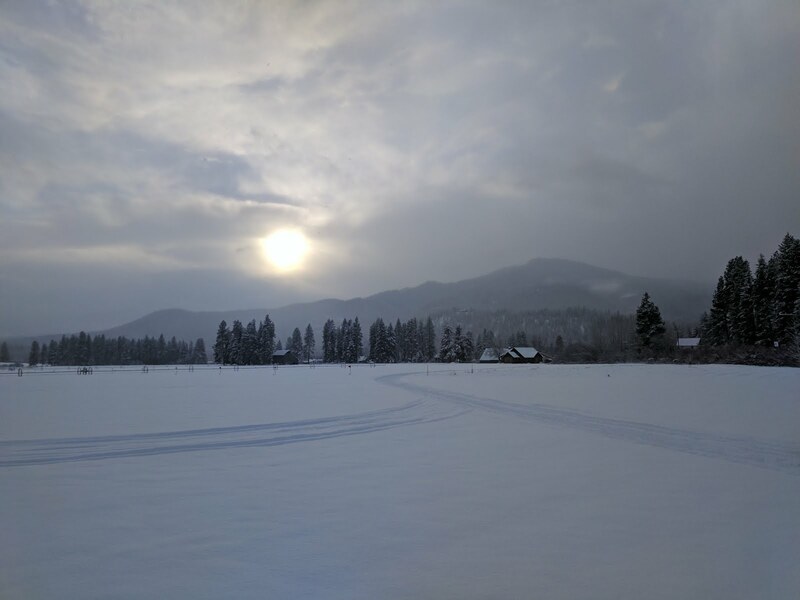 Although the snowfall was relatively light this early in the season it was enough to put a pretty white blanket over everything. We made a large loop around the field then came back around the lodge where we picked up a good bit of speed. It was amazing that these two draft horses could pull us around with such ease. 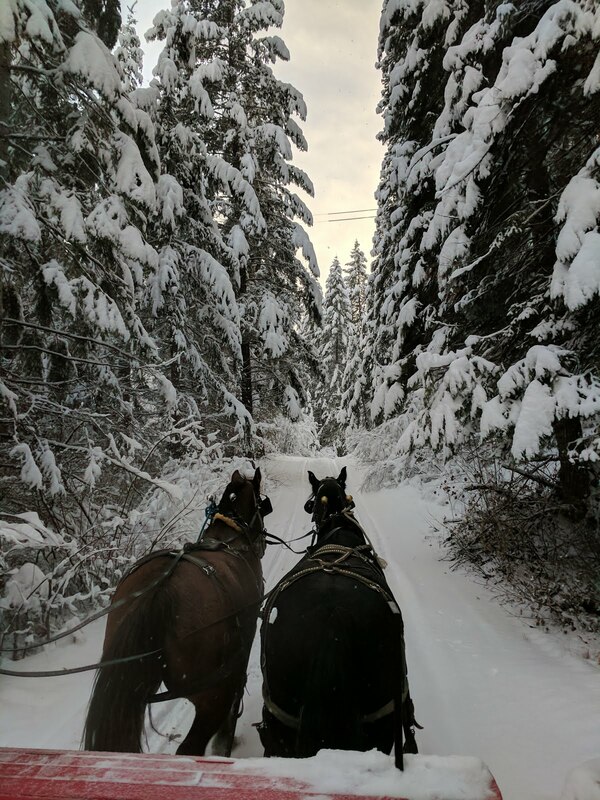 We probably had about 12 people on our sleigh and the guide said if left to their own devices, the horses would run with us. That might have been fun, but a bit intimidating as well. Instead, he kept us at a good, steady paced with allowed us to enjoy the ride, our beautiful surroundings and one another. Eventually, we made our way into the woods where the path got more narrow. About the same time, the snow started to really come down and the light was perfect. It was the most magical scene. It was such an amazing experience that Adam took a short little video. The best part of the video is that you can hear the sleigh bells on the horses too. Be sure to turn up your volume for a real experience! 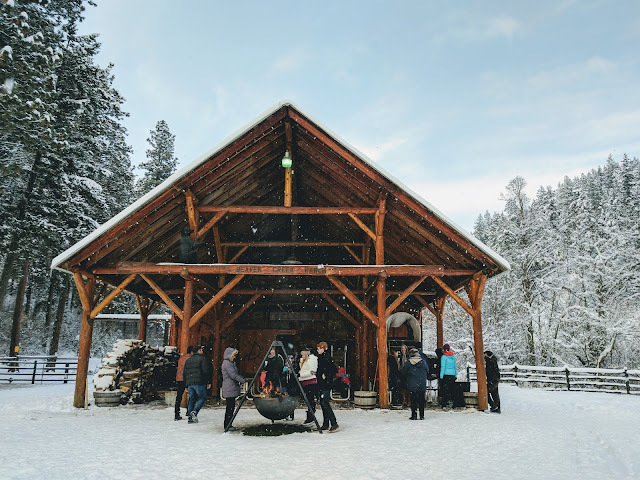 After our jaunt through the woods, we pulled up to the barn where they had a warm fire and some hot apple cider for us to enjoy. The horses got to take a break although I don't think they needed it. Landon and another little girl really enjoyed getting to pet the horses. They were so gentle and sweet. They were a breed of draft horse called Percherons, which aren't quite as big as Clydesdales, but they were close. 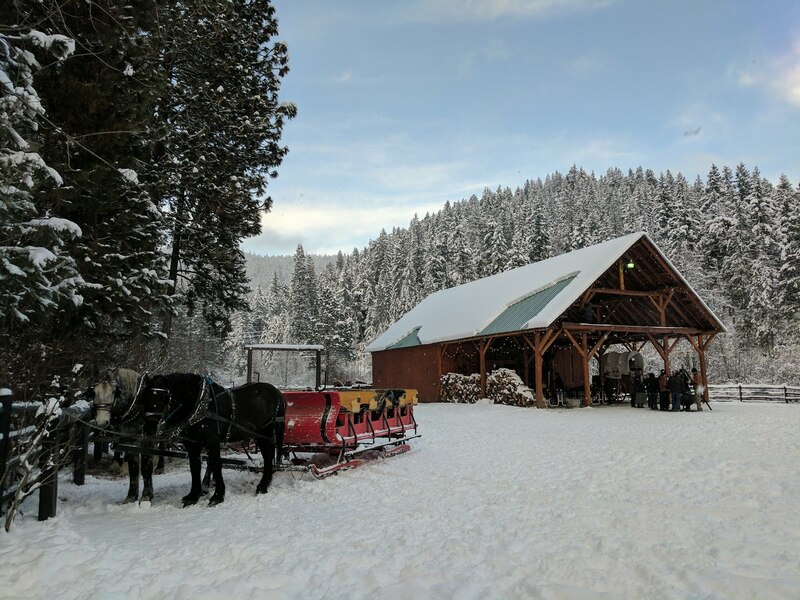 The horses, the snow, the barn, and the mountains made for the most picture perfect scene. With all the beauty and excitement around us, we didn't even mind the cold. After our break, we loaded back onto the sleigh and were back at our starting point within a few minutes. The only complaint I have about the sleigh ride is that it didn't last longer. Had we been given the opportunity to go for another ride right there, I think everyone would have taken it. It was a fun and unique experience and we all enjoyed it thoroughly. We said goodbye to the beautiful countryside and headed toward Leavenworth. 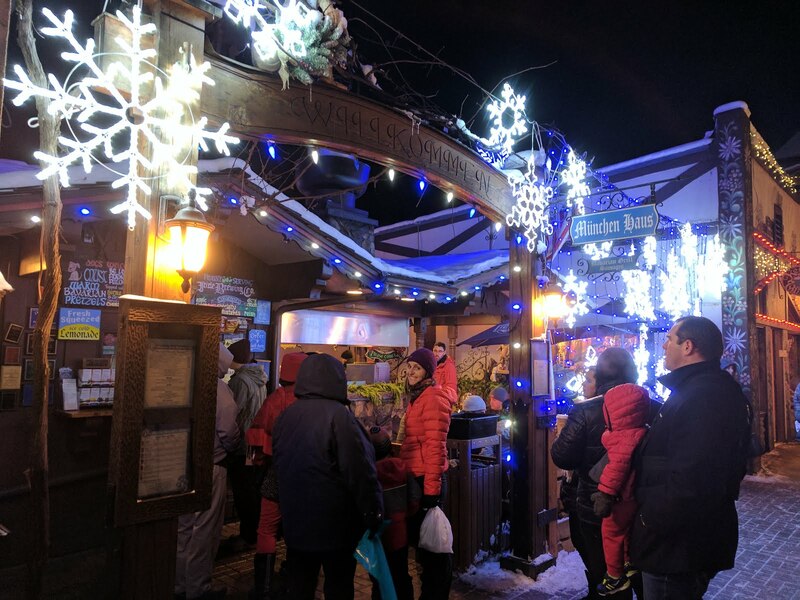 Since it was the middle of December, Leavenworth was all lit up with lights. We arrived just as sun was going down and after coming out of the Christmas store, the entire city was all lit up. Although the town stays lit up until February, they do have special events on the weekends leading up to Christmas. Carolers fill the pavilion and sing songs all night while the main street is closed to cars and lots of people fill the streets. We stopped by our favorite eatery, the Munchen Haus. This is the beer garden of the city, but even us non-beer drinkers can appreciate their yummy pretzels and hot dogs. 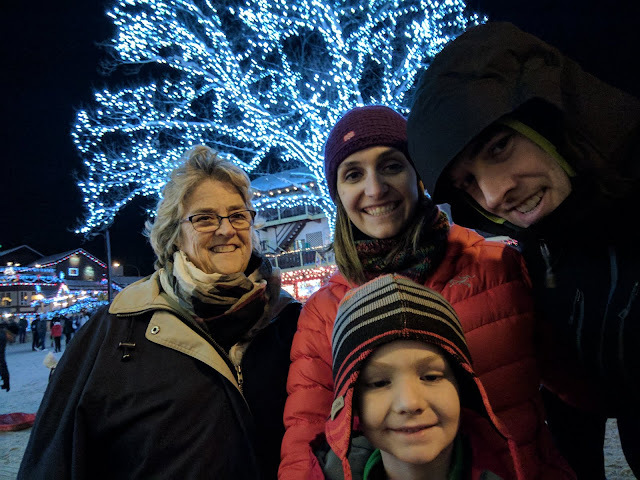 We walked around doing a bit of Christmas shopping and enjoying the pretty lights. At one point two people came out with traditional Alphorns and started to play. Despite having visited Switzerland, this was a first for us. 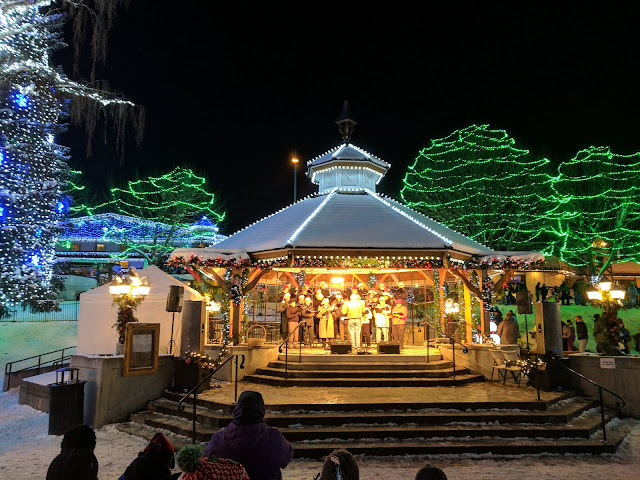 The amazing sleigh ride, the gorgeous white snow, the beautiful day in a beautiful mountain setting, the infectious Christmas spirit of Leavenworth, and great people to share it with made for a wonderful and unforgettable day. A special little Lewis turned a whopping six years old on Sunday. Having recently gone away to Victoria, we opted to stay home this year and have a fun filled weekend centered around him and he ate it right up. I made a list of things we could do in advance and let him fill his weekend as he pleased. You can also read about what we did for five, four, and three too. I love looking back and reflecting on the new things he's accomplished and done each year. There is nothing more amazing than watching a kid grow. His birthday weekend stated Friday after work/school. We got home, made some dinner, then headed straight for the gym. We've all gotten pretty hooked on a new sport, rock climbing. It's an awesome way for our family to get exercise together on a regular basis and the gym we go to is very family friendly and 5 minutes from our house. We take turns climbing or put Landon on auto-belay near us while we belay one another. Landon definitely has a natural ability and really enjoys it which makes it all the more fun for all of us too. He’s also really good about cheering us on and the motivation we give one another is really rewarding. If he keeps at it, I think by his seventh birthday he will have passed me up in ability. The only advantage I have is my height and I don't know how more years I will have that. He enjoyed his yummy doughnuts and then we set off for our first activity of the weekend. Grandma had given him a gift certificate for his birthday to a nearby paint your own pottery store before she left. We had made one as a birthday gift a few months before and he’d been wanting to paint something for himself ever since. So after breakfast we walked over to Redmond Town Center and picked out a piece to paint. They were out of the dragon he really wanted to paint, but after a lot of looking and hard time deciding he finally settled on a football helmet piggy bank. We were going to model it after his hat and paint the seahawk logo on the helmet, but it proved a little too much for the two of us. He settled instead on Seahawk colors and was really annoyed when a toddler came over and kept calling it purple. Although we don't watch football, the fan base here is so dedicated that it has rubbed off on him too. It doesn’t hurt that their logo is pretty cool! Now we wait until Saturday and pick it up after it has been fired in the kiln. Leaving it for a week is always the hard part. Afterward, we stopped by Subway for some lunch. Of all the places he can go, he loves subway. We tried to go Go Karting afterwards, but they were completely booked for the day so we decided to go ahead and take him to pick out his big birthday present. He got a scooter for Christmas 2015 and ever since has been asking for a skateboard. We kept telling him to keep practicing on his scooter and we'd get him one for his sixth birthday. Since he loves skating so much as we live only a few feet from a skatepark, we had to make good on our word. He picked out one his size and the guy at the store showed him the basics on how to "properly" ride. Then he got to add some spacers, tighten the wheels, and get it ready for the skatepark. And now he's a proud skateboard owner, a VERY proud owner! He would have preferred to spend the rest of the day riding is skateboard at the skatepark, but we had a cub scout outing to attend. It was their yearly Derby Car races and supposed to be one of the biggest, most fun events of the year. He had drawn his car the week before at the pack meeting and we had it cut out. Next he painted it, Adam added the wheels and some weight (in the form of nickels glued to the bottom) and we impounded it with the pack to be ready for race day. It was a completely different experience from what I expected and I’m not really sure what the point is, but the kids obviously enjoy it. That’s not to say some of the adults don’t enjoy it more, but not the adults in this family. Landon’s cub scout pack is the youngest and it was cute to see all their cars together with their different designs. Landon’s is the rainbow car second to the right. The name he gave it was “I don’t know” which he derived from them asking him what the cars name was upon impounding. He ended up getting third place for his pack. At first he was sure he wasn’t going to get a medal, but then when he did he really wanted first. Maybe next year! Sunday was his official birthday! I told him he could wake me up whenever he woke up and so he got us all up at 6:30am. Luckily, we had decorated the night before, leaving balloons all over the house and putting out his gifts. Since we knew we’d be gone all day, we figured we could just do cake and presents first thing in the morning. Shockingly, he didn't want to eat cake. He said, “Mom, cake is eaten at nighttime” so we saved the cake and went right to the gifts. He got a climbing harness from Grandma and some climbing shoes from us. He also got a really cool bey blade from his Aunt Katherine and cousin and some money from his Nana and Noni. I’m not sure anything lights up his face more than money, but I know he’ll use his climbing gear the most. 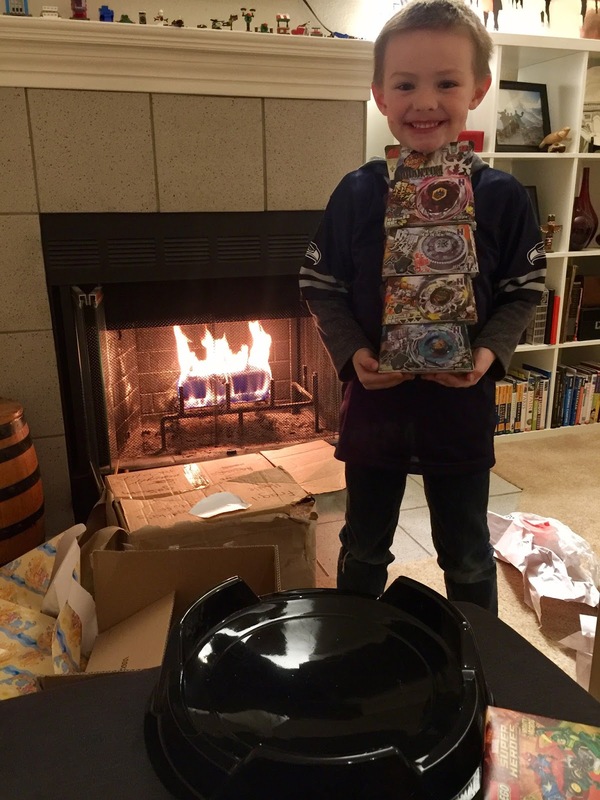 His only regret was that he didn’t get his bey blade arena which happens to be coming from Grandpa/Nana just a few days late. Since it was really the only thing he asked for, it took a lot for me not to tell him. He was extra surprised when their gift came this week and he was so excited that Grandpa pulled through for him. After opening gifts, we had to go pick something up an hour away and it had to be done that day so we loaded up into the car to tried to make it quick. Landon wasn’t too excited to do something not for him on his birthday, but we let him bring his skateboard and practice along the way and while we waited for to meet some people. 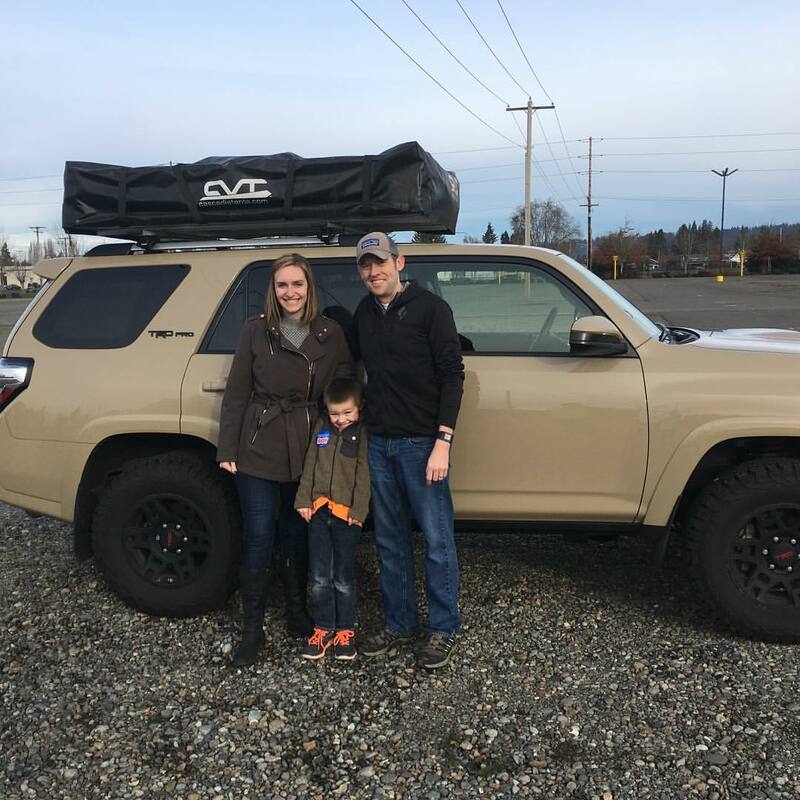 We picked up our new item an hour away, a new rooftop tent. We bought one in November, but saw this one online from a better company for a great price and had to jump on it. It was the best gift of the day, one for the whole family and we are going to have so much fun this year in it. Landon just couldn’t understand what the big deal was. After we got it setup, we headed back towards our house for some fun Landon could appreciate. Back to go karts to make up for our lost try the day before. 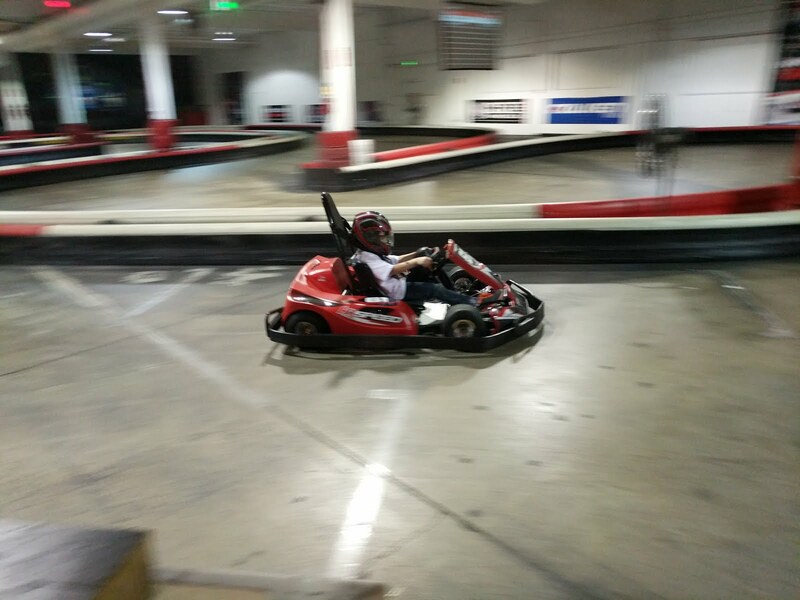 We took him go karting when he turned 3 years old and he had been on a few kid go karts since then, but this was his first time in a real go kart driving himself. He barely fit the 48’ height requirement, but he had a blast running around the track for two races. We had some time to kill before our next activity so we thought we'd go back home and skate at the skatepark for a bit. Landon was dying to get out on his new skateboard, but the weather just wasn’t cooperating. It was sprinkling off and on, cold and windy so Adam and Landon played bey blades for a bit while Mom took a quick nap. He also got his big birthday lunch, peanut butter and jelly sandwich...once again it was what he wanted. Before heading out we decided to pullout the new tent and show Landon. He thought it was really neat and got super excited once we got inside. We packed it backup and headed over to a nearby trampoline park and laser tag facility. Unfortunately, the laser tag was sold out so we had an hour to kill before our jump session. We passed the time at their arcade playing foosball, pinball and a few other games. They happened to have Tekken which is the only game I’ve ever been good at or enjoyed playing. It was so fun getting to play it with my own kid and getting to watch him play it. Since he has no access to video games at home, going to an arcade is like striking gold for him. Finally it was our turn to jump! It had been years since we went to a trampoline park and Adam had never been so we all had a blast running around and bouncing from place to place. I’m not sure who had the most fun, but boy was it tiring jumping constantly for an hour. We shot hoops, did flips into the foam pit, played dodge ball and bounced from wall to wall. We thought we would play a game of laser tag after our jump session, but looking at the small and boring setup they had for laser tag we decided to hold off and take him to a better facility in the near feature. Instead, we made our way to last stop of the day for dinner and a bit more fun. I had been reluctant to take him to Chuck E Cheese and he only knew about because kids at school talk about it. There is one near our house and I was surprised a few months prior when he read the sign and talked all about how he wanted to go. It really wasn’t as bad as I thought, but it was a little crowded and the money for a card, to get a coin, to play the game, to get tickets, to get a prize drives me a bit crazy. Still, we managed through it and Landon had fun even though he isn’t good at any of the games. The food wasn’t bad and it felt like a real blast from the past seeing the characters on the stage looking exactly like they did when I was a kid. I remember having my brother’s birthday party there when I was about Landon’s age. It seems some things never change. We got home just in time for some birthday cake and little bit of rest before bed. It was such a great day and a great weekend. We enjoyed celebrating Landon’s big sixth birthday with lots of fun and love. I know six will be another big year with lots of changes and new experiences. I hope he can enjoy every second, learn and grow every day and appreciate it all. P.S. I have been looking for trick candles and wasn’t able to find them anywhere. My Mom recently came across some at her house and brought them to us last month. There’s no telling how old they are and I had high hopes for his reaction. Instead, I think we found out why they are no longer available. Below is a little video of our experience.